Development of Re-Os isotope geochemistry was carried out by a small group of innovative and visionary scientists who were hit by a massive USGS reduction-in-force and science. The reason given at the time was “the limited utility of Re-Os”. In 1996, the AIRIE Program was born. This small group re-established itself in an unused laboratory space at Colorado State University, and receive no financial assistance (salaries or operating costs) from CSU. Our dogged determination and persistence gave way to a research program whose pioneering work and accomplishments have benefitted the university. From the beginning, we have been among the most internationally known research groups at CSU. Forging a fruitful and mutually beneficial 18-year-long partnership with Norwegian researchers and institutions, and with Europe, we have become their Re-Os facility for resource geology. We are grateful to the USGS for allowing us to take two 50-year-old mass spectrometers with us to CSU. We are grateful to the US National Science Foundation (and all the proposal reviewers) for believing in us, and for 13 awards as we developed and applied new technology, and for funding AIRIE’s first multi-collector Triton mass spectrometer tuned for Re-Os. We are grateful to the Norwegian petroleum industry (especially Eni-Norge, Equinor, Aker BP, Lundin) for providing base support for the AIRIE facility, including a new state-of-the-art Triton built for Re-Os, and for providing salaries for research associates, post-docs, and students. Without their continuous support over the years, and the support of the mineral industry, we would not have made it. Our vision for the next decade is to reach higher and run farther through expanded partnerships engaging nascent complementary technologies, laboratories, and complementary expertise – all the while staying grounded in the geologic relationships presented through observation – a hallmark of the way we work. 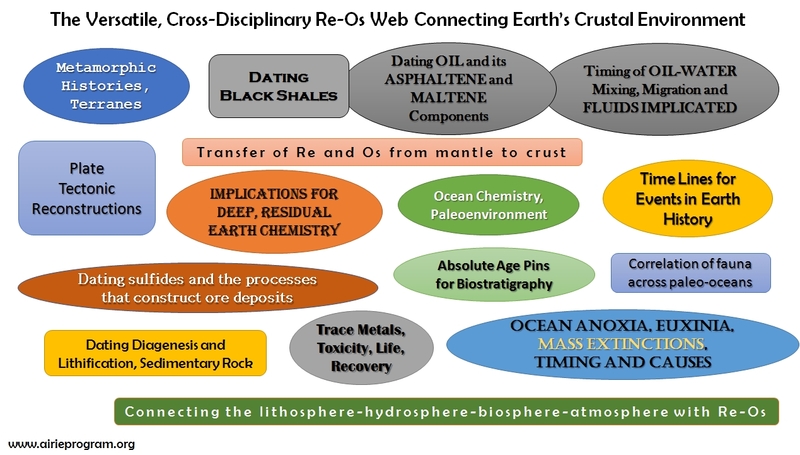 The AIRIE Program opened Re-Os isotope geochemistry to crustal rocks. We address questions on source, process, timing, and resource geology, stepping across and tying together seemingly unrelated topics.